At Dónal Carroll & Co. Solicitors, we are your legal services partner first and foremost, facing issues together, responding not just to your existing legal needs today, but anticipating the needs of tomorrow. Dónal Carroll & Co. Solicitors is managed by its principal, Dónal Carroll who has been working in the legal services sector since 2002. On completion of his Bachelor of Corporate Law and postgraduate LLB degree at NUI Galway (UCG), Dónal joined McEnroe Solicitors, a leading commercial and general practice on John Street in Sligo. 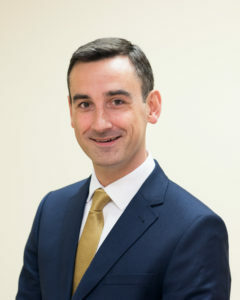 Under the tutelage of an experienced local practitioner, Pat McEnroe, Dónal completed his apprenticeship with McEnroe Solicitors and qualified as a solicitor in 2007. Dónal continued to work with the firm for a further 11 years before deciding to set up his own practice in 2018. When dealing with both corporate clients and private individuals, a working knowledge of tax law is of great advantage across a wide variety of areas. Dónal undertook and completed the tax exams of the Irish Tax Institute and was admitted as an Associate of the Irish Tax Institute in 2011. Dónal’s wide ranging legal experience straddles the “Celtic Tiger” years, the subsequent recession and the slow economic recovery that followed. Over the years Dónal has worked with a variety of clients, from business owners, large corporations and pension funds to young couples purchasing their first home, to elderly clients providing for their children. In dealing with them all, he has proven to be highly professional, empathetic, honest and approachable. Dónal is a member of the Law Society of Ireland, the Irish Tax Institute and the Sligo Bar Association. At Dónal Carroll & Co. Solicitors we aim to provide an efficient, high quality personal service to clients, both private individuals and business owners. To ensure a speedy resolution to any problem or issue we have a policy of a same day response to client calls and emails, where possible, and if not possible the day of contact, it is our policy to respond within 24 hours. We will ensure your transaction runs smoothly with up to date communication provided at all times. We use a client focused and collaborative approach in all our dealings to ensure your needs are met and a successful outcome is reached. If you are looking for legal advice that is personal, practical and solutions focused, contact us today.